Magical soul gems have been stolen from the secret vault of the goddess of death and scattered across the planes. Some want these gems to unlock the secrets of the multiverse. Others want them for personal power. Still others want them to resurrect a fallen deity. As the god of oblivion looms near, can the PCs retrieve the gems from their new owners in time to save their world? 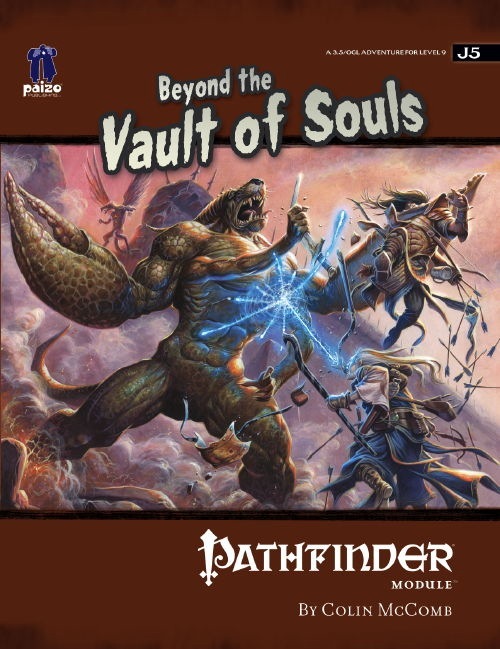 Beyond the Vault of Souls is a planar adventure for 9th-level characters, compatible with the 3.5 edition of the world's oldest roleplaying game. Within you'll visit the Eternal City of Axis, brave the dangers of the Abyss, and match wits with the torturer daemons of Abaddon. This adventure is set in the Outer Sphere of the Pathfinder Chronicles campaign setting, but can easily be placed in the strange planes and dimensions of any game world. It can be used on its own or enhanced with information from Pathfinder Chronicles: The Great Beyond—A Guide to the Multiverse. Pathfinder Modules are 32-page, high-quality, full-color, OGL-compatible adventures for use with the 3.5 Edition of the world's most popular fantasy RPG. All Pathfinder Modules include four pre-made characters so players can jump right into the action, and full-color maps to enhance play. There are a lot of big, neat concepts here; it may be worth buying as an idea source. Some good description, too. But it reads more like an outline than a worked-out adventure. This is especially problematic in part I where I almost have the impression that the PCs are supposed to sit on their hands rather than attempting to complete their mission. The module also indulges itself in a lot of heavy-handed NPC pushing of the PCs. It is not really a good idea to say "This NPC is too powerful for the PCs to fight, therefore they won't even try, therefore no stats are needed." Players don't tend to like this, and sometimes the hapless GM *will* need some stats. While you could argue that the PCs should be more careful, frankly if I were a careful PC I would refuse this assignment, as it seems well above the pay grade of the 9th-10th level PCs it is supposed to be for. So the PCs must be bold enough to do this, but lose that boldness at key moments--a difficult line to walk for both players and GMs. I'm not entirely sorry I bought it, but I can't run it. Parts II and III might work tucked into some other adventure, if I ever need a short scenario set on those planes. The two big planar trips are quite similar and the cool new planar stuff the players get to mess with only makes the "boss" stronger. Not fun! Also the final battle is a nightmare to run. Finally there are a lot of monsters you will need to sub out unless you have Tome of Horrors as the stat blocks are not complete, giving only HP, CR and a page reference. There is a lot of nice ideas to expand the scope of the adventure though - kudos for this! We need more Planar stuff!!! Amazing adventure. 32-pages of 3-4 session gaming. Planescape author with just as much psycodellic planar stuff as you remember from the good old days. A little effort on the DM side to make it run smoothly. Oh, for sake, just grab it. Paizo! We want more planar stuff!!! Keep em coming! Written by one of the authors of the Planescape setting line, this module is the first planar adventure in the Paizo lineup. "Beyond the Vault of Souls" features everything that made Planescape unique and vibrant, with dimensional travel, dead gods, daemons, demons, philosophy and strange answers to weird questions. It's not a dungeon crawl and it's not an urban intrigue. There's a strong feel of other-worldiness and mystery. The are no philosophy clubs here, only philosophers with clubs. No Modrons sadly, curse you Sorcerers at the Bay ! All in all, if you are a Planescape fan and/or you are looking for an unique adventure, this one is a keeper. Not up everyone's alley, but certainly up mine. Excuse me, there is a keketar protean in my garden and he sings his song of ten thousands poisons. Ohhh yes, Planescape is back. SERIOUS NOTE (really): This module pretty much expects the DM to have access to Paizo's The Great Beyond and Necromancer Games' Tome of Horrors Revised. Which is okay, as both books are all kinds of awesome. Great module and well worth the buy. I've written up a review on my Examiner page, so rather than repeat myself, go ahead and read it here. Nice. Been looking forward to a Pathfinder-Planescape adventure. 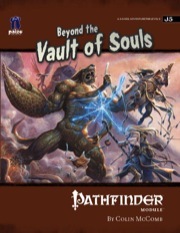 From the vault of the gods in the planar nexus of Axis, to the fields of Elysium where righteous heroes battle endlessly even in death, and on past the gates of Hell itself, the PCs must race through portal after portal to recover the lost souls before sinister outsiders can beat them to the prize. You know, maybe it's just me but that description seems awfully ambitious for 32 pages. I'm not doubting it's possible, but you describe three planes there as well as where the players start, that's gotta be a lot of maps. and encounters. Either way, I'm really looking forward to this. some of my players fondest memories are when I bounced them around Planes and Demiplanes. Colin McComb...of Birthright fame? I haven't seen anything from him in years, but look forward to checking this one out. This module looks like its got a huge amount of potential and is one of the ones I'm really looking forward to. The J series has been pretty solid so far. Quick question for anyone in the know are the planes mentioned above the only ones the PCs will visit or will there be more as well? Quick question for anyone in the know are the planes mentioned above the only ones the PCs will visit or will there be more as well? Given that we've seen adventures and product descriptions change pretty drastically between announcement, development and release, I'd say that anything here is subject to alteration down the road. I imagine we'll know more specifics when it's closer to coming out or after it's on the shelves (to avoid spoilers and all). I'm not certain the planes in the description are precisely all those in the module -they're included among possibly more- but that's not my question to answer. Sean or Colin can say more. That said, it rocks to have Colin writing something planar again. True it is a bit early to tell what the final content will be, regardless it sounds like a great theme for an adventure. Thanks for the answers guys. 32 pages for multi-planar travel? I guess there will be Campaign Chronicles and maybe Pathfinder Companions to supplement this adventure, but still... 32 pages! Birthright was my favorite 2nd Ed. setting, and Planescape second favorite. I'm looking forward to this product. A dream come true would be an resurrection of Birthright. Is there any possibility for Paizo to make that dream come true? Birthright is owned by Wizards. I don't think they have any interest in bringing it back as a full setting, or licensing it for other companies to develop. That said, who knows what the future holds? We have some interesting things bouncing around Ideas For Future Product Land, one of them may end up like BR. It is heading out for playtesting right now, and I am overall very happy with it. We'll see my reaction when Sean's done "developing" it - we might also say he'll be "taking a chainsaw" to it. I'm incredibly honored to have been asked to write this, and I hope everyone has as much fun playing it as I did writing it. No Colin McComb of PLANESCAPE fame! I'm really looking forward to this one. Paizo, you guys are awesome! Holy s+%&, haven't seen this yet. Consider it bought. It is great to see you on the boards. Hopefully we will see more of you and (better yet) more products from you! Thanks! I don't know if I'm allowed to say anything about any potential new products or anything, so I'll say, "yeah, me too! ", and maybe make a cryptic wink or something. Colin McComb is the very first professional game designer I ever worked with, as he referenced some of my notes on the AD&D Abyss for his excellent Planescape book, FACES OF EVIL: THE FIENDS. That is, incidentally, the first D&D book in which I received a name credit, which was a HUGE deal to me at the time. Colin is a class act, and I think the Planescape line sticks out as a silver lining of Second Edition (which was mostly cloud) in large part because of Colin's writing. I am thrilled to be working with him on a Pathfinder product. The module focuses on a site in the Abyss, a site in Abaddon (Grey Wastes), and a border town that may well be in the Outlands. There are side notes that a DM could easily spin into several others. I should add that my original thought was to have about eight planes until I was rightly convinced that I could hardly do justice to any of them in that limited amount of space. I trimmed it back, and then discovered I was over by about 10,000 words (approximately 16 pages). Hell and Elysium will have to wait - but the way the adventure is set up, you can have side quests and attachments to this adventure without disturbing the overall flow. If you'll pardon my saying so, it's... ahem... modular. In case the credits for Faces of Evil weren't specific enough, I would like to reiterate that Erik's notes on the Abyss were incredible, and that I had many thought-provoking discussions with him about the nature of evil. FoE would not have been nearly as good without his input, and I was/am delighted to see him become a superstar in the industry. Without a doubt, Planescape sticks out as a cutting edge product from the 2nd ed days, and Colin was one of key writers of that product line. As an aside, it seems that every writer from earlier editions of D&D that I wonder what happened to, pops up as a contributor for Paizo. I am hopeful that there will be more of these "old timers" making appearances as writers for the Pathfinder line up. The blog preview on this module has impressed me more than any module to date. Anybody else feelin' it or am I just succumbing to the advanced stages of fandom? I thought exactly the same thing. I read it, sat back, and said "woah, that's gonna be pretty cool!" I had to re-read it to believe this was just a module. The line of J-series awesomeness continues! I missed out on Planescape, so I hope this adventure will give me a feel for some of what I missed. I love the premise, and I can't wait to see how it works. I've updated the cover and description to match the finished product. I love how you did the title of the book on the cover. Todd Stewart dropped a little hint that some more daemons would be showing up soon. Are there any in this module? "Well, I don't exist in this cosmology, but for the moment I'll be Trelmarixian the Black's press secretary. And on behalf of my syrupy employer the Lord of Wasting, I can answer that one with an emphatic yes since the module takes place partly inside of his native plane. Trelmarixian will make some appearance as an alt on the boards at some stage once there's an appropriate picture for an avatar." Get outta here, you sly fox! Ir was a hoot to playtest! I think you guys will like it a lot. Delivery to our warehouse has been delayed... we're now anticipating arrival on Monday. Dude, I'm stircrazy waiting to see how the artwork on the interior turned out. So uh I guess it's been delayed a bit more then? We're awaiting word from the trucking company. They're shooting for tomorrow. We have heard that before, of course... but maybe this time it's for real. Well, it is backwards compatible. And anything straight from the MM will most likely just be a reference to a page number. So you can refer to the Bestiary in September instead. You'd only "need" to convert any NPCs with class levels and perhaps some skill checks or traps depending what they are and how the skill in question changed from 3.5 to PFRPG. Having not read the adventure yet, I can't say how much it would lean to one extreme of ease of conversion to the other, though. There's nothing in here that would require you to expend any effort converting. If you really wanted to, you could add a couple of feats to the high-HD "bosses" of each section to account for the change in the number of feats creatures get, but if you don't, no biggie. Just downloaded and glanced through - Wow! This is going to be one cool adventure!! At first glance, the artwork is stunning, and wonderfully evocative of the multitude of very different settings that are present. Kudos art director! Sounds cool! Consider it sold to me! Having read over it, that's awesome that it's not going to waste on the editorial desktop recycle bin. Shame the thanodaemon working for Charon couldn't make it in either.